This post is about food. 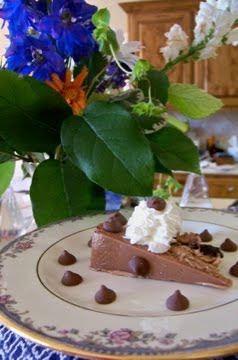 I usually prefer to put food posts on my cooking website. However, I cannot for the life of me figure out how to post photos to that WordPress template. Probably has nothing to do with the fact that I haven't updated the template in like three years. I am, however, a pro with posting pictures to my blogger template. So rather than continue to spin my wheels over it, I will post here. But if you get hungry, hop on over to Common Cuisine for the recipe, K? You might like to know that during my first pregnancy I drank half a gallon of milk every day for five months. At four months of gestation, I saw my brother-in-law, Wesley, get a glass of milk to go with his spaghetti, and I thought, Hey! That sounds perfect! And that was the end of it. After that time, I was frequently overheard to say things like, I'm hungry. Think I'll get a glass of milk. Crazy, I know. During the final month of that pregnancy, I finally figured out I would like something to go with my milk, and seized upon a bag of fun size 3 Musketeers candy bars. It disappeared oddly fast. So I had to go get another. And another. I don't drink much milk now that the pregnancy craziness has ended, except on spaghetti night. But my love affair with 3 Musketeers was only beginning. I don't understand it, since they are just made from fluff (boring) and milk chocolate (I prefer dark). But after a lifetime of Snickers and Reese's PBC loyalty, and an ongoing affair with Dove Promises, my true love shifted to 3 Musketeers. I usually keep a couple in my fridge now, for the chocolate emergencies that frequently occur at 4pm and 9pm. There is not one at this exact moment, which is bad because now that I'm talking about it I want one! And 4pm is coming soon. On a (soon to be) related topic, I have a cheesecake cookbook. Yep, that's right, an entire book devoted to cheesecake. The cover promises, "More than 100 Sumptuous Recipes for the Ultimate Dessert" but I can't verify that because I have probably used about 5 of the recipes. Straight-up Plain-Ol' Original, Key Lime, and some kind of chocolate. That's actually only three. It occurs to me suddenly that I should be writing in this book every time I use a recipe, so I know what I thought about each one, and whether I should do that again, or what I would do different. But that would require me being totally awesome, and as you probably already know, I am only mostly awesome. Most of the time. After a three year hiatus from cheesecake making (I think the last time was for the same party I made the Swan Dress for), I pulled out my book a few weeks ago. And found that I had made myself a couple of tabs, presumably for recipes that look especially good to try next. Good for me! I was shocked to see one of the tabs said, "3 Musketeers." Great day in the morning! I knew about this, and forgot? Having kids really does kill your brain cells. I just so happened to have promised a cheesecake to a friend who had a baby last week. So I made the 3 Musketeers cheesecake for her. It is actually called something else in the book, but I know the truth. And the batter tasted just like the candy bar. Sublime. Elizabeth is a good friend who understands about cheesecake. Or else I am pathetic and it shows all over my face. Because when I arrived at her door with the cheesecake, after I begged to take a photo of a slice of it, she offered me a piece. Of my own cheesecake, that I had brought to her as a gift. And I accepted. And it was so good I could almost see through time for a moment. 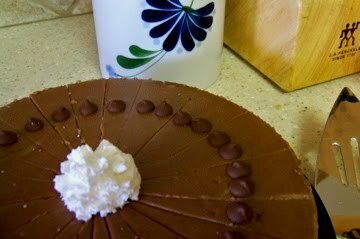 I will be making another 3 Musketeers cheesecake in the near future. But cheesecake doesn't taste right if eaten alone. So if you would like to be invited to my 3M cheesecake eating party, please leave me a comment and I'll post you on the exact time and date.